Do You Use One of These Passwords? "Think you have a secure iPhone password? 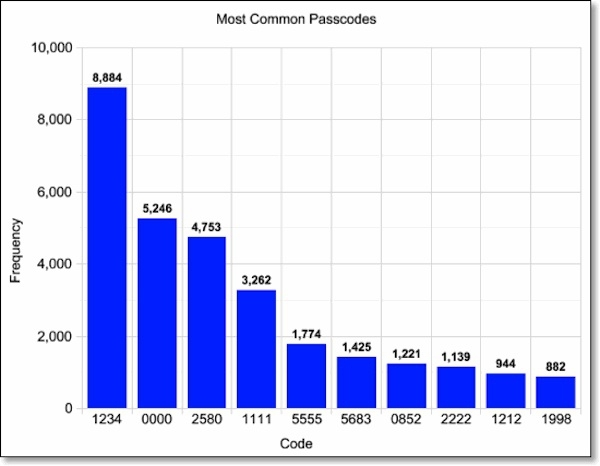 Check this list, you might be using one of the freakishly common passcodes out there, and if so, it's time to change it." 1234 is the most common? Probably not coincidentally, that is the radio code we use for people that are mentally impaired to warn responding officers and firefighters the person they are dealing with may be unstable. 0000 isn't much better though in my opinion.